Boat travel lift is a kind of non-standard gantry crane that is widely used in harbor and dockside to haul boats. It can lift out vessels or yachts of different tonnage from water as well as arrange these boats in a row onshore so as to optimize the yard space usage. The lifting capacity is usually in a range of 10 ton to 1200 ton. In addition, the boat travel lifts are ideal options for vessels that need to be lifted onshore to carry out maintenance and repair work, or for the launching of newly built vessels. Ellsen company is an experienced gantry lifting equipment manufacturer and supplier in China, and we offer a variety of boat lift travel lift for customer’s needs. The boat lift is normally designed and fabricated according to different requirements of customers who need to lift and transport boats or vessels onshore or out of shore. 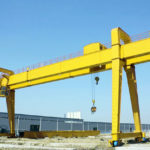 It can also be used in shipyard, yacht clubs, water recreation centers and navy to perform various lifting jobs with strong safety and reliability. 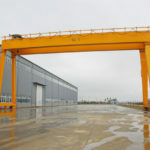 Unlike conventional gantry crane, the marine travel lift boat hoist typically comes in U-shaped double-gantry connecting frame so that it is able to handle large-sized ships and realizes a smooth water entering and exiting of boats. The boat travel lifts for sale is with good quality and reliability, making it a perfect choice for marina and boat handling operations. To get the best boat travel lift price, contact the sales manager online today! The boat hoist uses soft but strong slings which will evenly pull the boat so as not to cause damage to its surface and structure. The hydraulic steering system is controlled by a cylinder or worm gear. 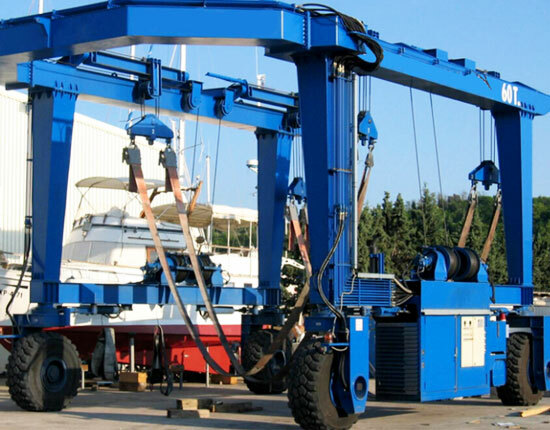 The boat crane lift delivers 12 kinds of traveling functions, such as straight, oblique, in-situ revolving and Ackermann steering in order to suit different working conditions. 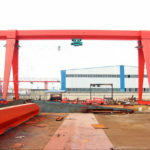 The boat gantry crane is with 4% climbing ability, which provides convenient and flexible handling of boats and also helps save yard space by arrange ships in a row quickly. According to the width of boats, the variable-span travel lift can easily adjust the span. The main beam and end beam is hinged to eliminate the stress caused by uneven road surface during working. The hoisting mechanism adopts a load-sensitive hydraulic system and has low energy consumption. The boat travel lifts fall in multiple types and models for you to choose from. They can be grouped by capacity, working occasions and designs. Regarding lifting capacity, the boat marine travel lift can be divided into light duty and heavy duty type. The light duty travel lift is designed for hauling small size and tonnage vessels, such as 25 ton and 35 ton marine travel lift, whereas heavy duty travel lift is capable of handling large-sized ships up to one-thousand tons. Sorted by working occasions, the boat travel lift is available in shipyard travel lift, port used travel lift, yacht travel lift, dock travel lift, amphibious travel lift and so on for your choice. 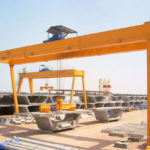 Depending on the places and environmental conditions where the boat cranes are employed, we will design the best lifting solution for your businesses. According to power source, the travelift produced by our company has electric boat hoist and hydraulic boat lift for you to choose from. 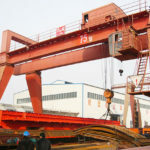 Strong beams: by virtue of careful welding of the whole beams, the U-shaped frame has light dead weight and high degree of horizontal and vertical rigidity. End carriages: this unit serves as the travelling mechanism of the crane and provides stable movement. Spreader: it is the unit that carries heavy loads. Basically, the spreader will be specifically designed on request. Electrical device: it will be sourced from reputable brands like Siemens. With regard to vessel configurations, working conditions and safety precautions, the travel lift boat hoist comes in optimal design and fabrication. Here are some basic information for your reference. 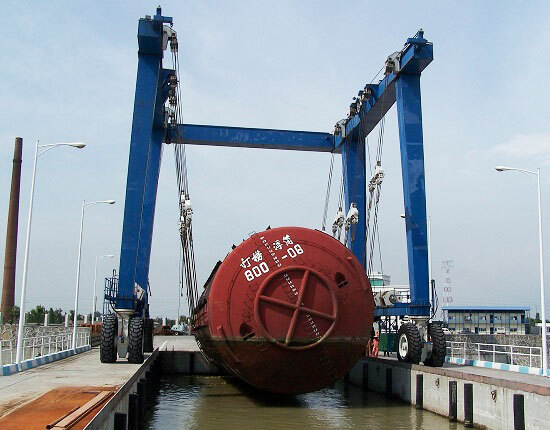 Boat lift capacity: basically, boat travel lifts manufactured by our company can handle large ships up to 1200 ton. Ship lift length and width: it can be customized according to practical needs of customers. 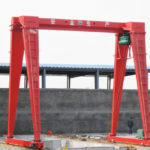 Besides, variable-span design is available that provides flexible and convenient adjustment of crane span. Drive mode: the marine lift commonly adopts hydraulic drive system. For some applications of small tonnage boat handling, we can also design an economical electric drive system according to customer’s needs. Operation and steering modes: generally there are varied modes for operating and steering the boat hoist, such as straight, oblique, Ackermann steering and in-situ revolving. Hoisting mechanism: it uses a load-sensitive hydraulic system, and the distance of lifting points can be adjusted. 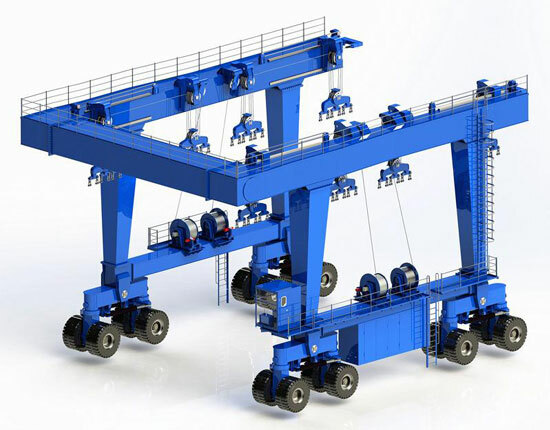 As a result, the travel lift crane will achieve a simultaneous lifting of multiple lifting points, and at the same time, the power will be output according to load condition. In this way, energy consumption of the entire crane can be reduced. Boat lift control system: wireless remote control is usually adopted to operate the equipment. Boat lift slings: flexible lifting slings are adopted to cover the bottom of the hull. Exactly How Much Does A Boat Travel Lift Cost? As is a non-standard customized lifting equipment, the boat travel lift price will vary widely. If you would like to know the price of a specifically configured travellift, contact us online or leave a message in the contact form. We will offer you an economical price. As one of leading boat travel lift manufacturers and dealers in China, we promise to provide quality product and dependable service for clients. 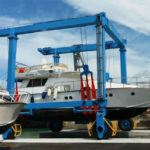 If you are unsure as to which boat hoist configuration and design will best serve your needs, we are more than happy to help you design a solution that delivers appropriate boat handling. 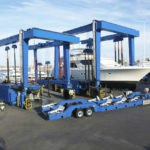 To know more about boat travel lift, contact Ellsen machinery!